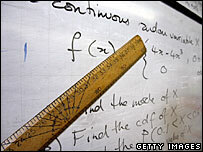 Progress in maths stalls in the first years of secondary school, an academic's study suggests. Research by Professor Julian Williams from Manchester University concludes that pupils plateau in maths between the ages of 11 and 14. The study involved independent testing of more than 12,000 pupils aged from five to 14. The government said its test results in maths had shown clear improvement since 1997 at all ages. Professor Williams, from the School of Education, said year on year improvements in mathematics were almost nonexistent for higher and lower achievers aged between 11 and 14. He said the study, conducted in England in 2005, showed "short term" increases in children's maths skills as they were taking national tests, but that their abilities declined again once the "Sats" were over. "We did record short-term improvements in test scores around the period of national testing at Key Stage 1 and 2 (years two and six of primary school)," he said. "However, these increases were short term and the overall trend continued shortly afterwards in years three and seven, suggesting lack of lasting gain in children's understanding." Results of this year's national tests for England show 77% of 11-year-olds reached the standard expected by the government, up one percentage point from last year. The proportion of 14-year-olds in England reaching the required standard in maths tests fell slightly this year. Some 76% reached Level 5 or above, against 77% in 2006. However, there had been a three-point rise over the previous year. A spokesperson for the government said: “Our test results in maths – which show clear improvement since 1997 at all ages - derive from 600,000 children taking independently audited national tests on a consistent basis, not a small sample. “In addition, following Jim Rose's successful review of early reading last year, we are now taking the opportunity to undertake a major review in mathematics teaching. "This will be conducted by Sir Peter Williams who is currently seeking evidence from across the range of experts in early development and maths education." Maths teacher Peter Hall, from the Association of Teachers of Mathematics, said pupils usually made good progress in Key Stage 3 (11 to 14). "We look closely at their progression measuring from KS2 (Year 6) to KS3 (Year 9) and almost all students make good progress over this period," he said. "Lots of students leave primary schools with very good numeracy skills and are able to continue into secondary school on the basis of these skills. "What proves hard for them is making progress in the more abstract elements of mathematics (like the more complicated algebra - the 'easier' algebra they can often survive on the basis of their numeracy skills)." Shadow children's minister Michael Gove said: "Gordon Brown has personally launched five initiatives on maths teaching but the result has not been an improvement in how our children are taught. "The credibility of government boasts about improving test performance is now being undermined daily by independent audits of what's really going on in our schools." The Manchester research was not a study over time but involved taking a snapshot of pupils' ability in each year at 111 schools. It is published in the Journal for Research in Mathematics Education. Other commentators have previously said there is a problem with children not making much progress in the first years of secondary school.